At some point before publication, a book assumes its final form, the form in which it is experienced by its audience. Naturally, this audience is often oblivious to the many sometimes complex decisions involved in constructing visual meaning through the montage of different ideas and elements. But, although these deliberate decisions are not normally communicated to the audience, the book is always to some extent a conception, or mediated presentation. 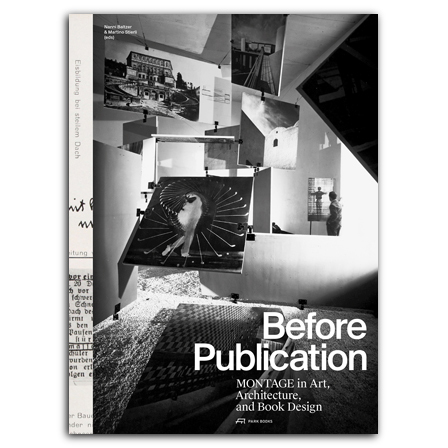 The contributors to Before Publication consider the construction of visual meaning through montage, with each essay taking as its starting point a particular artifact—from Ed Ruscha’s photobook Every Building on the Sunset Strip to works by Sergei Eisenstein, Muriel Cooper, and Marshall McLuhan to Tristan Tzara’s unpublished Dadaglobe anthology. A common theme threading throughout the texts is the relationship between privacy and publicity. A concise introduction by the book’s editors, Nanni Baltzer and Martino Stierli, places the eight exemplary artifacts in context and discusses the broader subject of montage in art, architecture, and book design. With essays by Richard Anderson, Doris Berger, Reto Geiser, Jason E. Hill, Olivier Lugon, Antonio Somaini, Adrian Sudhalter, and Robert Wiesenberger and an introduction by Nanni Baltzer and Martino Stierli. is an art historian, specializing in the history of photography and holding a research and teaching position on the history and theory of photography at the University of Zurich.. She has been a research assistant at the ETH Zurich, at the Canadian Center for Architecture, Montréal, and at the Accademia di architettura, Mendrisio. She was Assistant Director at the 9th International Biennale for Architecture in Venice 2004.
is an exhibition curator at the Academy Museum of Motion Pictures in Los Angeles. She was a curator at the Skirball Cultural Center in Los Angeles, and the director of Kunstverein Wolfsburg, Germany. She graduated in art history from University of Vienna, holds a PhD from University of Art in Braunschweig, and has been a postdoc fellow at the Getty Research Institute in Los Angeles. is an architect and scholar of modern architecture, holding a Master's degree and a PhD from ETH Zurich, with a focus on the intersections between architecture, pedagogy, and media. He is the Gus Wortham Assistant Professor at the Rice University School of Architecture where he teaches history, theory, and design. is an Assistant Professor of Art History at the University of Delaware. He completed his PhD in art history at the University of Southern California in 2011.
is an art historian and professor at the University of Lausanne. His research focuses on the history of photography, exhibition design and slide projection in the twentieth century. He is currently directing research projects of the Swiss National Science Foundation’s research projects. He was before a Fellow at the CASVA, Washington, and Getty Scholar at the Getty Research Institute, Los Angeles. is the 2014–16 Stefan Engelhorn Curatorial Fellow at the Harvard Art Museums and a critic at the Yale School of Art. He is currently pursuing a PhD in art history at Columbia University, where he specializes in modern and contemporary art, architecture and design.